The Ramon Aboitiz Foundation Inc. (RAFI) will hold the Run 2 Plant 4 Greenin Philippines 2012 on June 30, 2012 (Saturday). The event will be held simultaneously in 51 municipalities and component cities(including Bogo City). Run 2 Plant 4 GREENIN Philippines 2012 is organized in collaboration with the Cebu Provincial Government, Aboitiz Equity Venture, Department of Environment and Natural Resources, DILG, Talisay City local government unit and other LGUs in Cebu, and various government and private institutions. Run 2 Plant 4 GREENIN Philippines, one of the components of GREENIN Philippines program, is a fun run and planting activity that provides a venue for every Filipino to contribute in rehabilitating and protecting our environment with the goal of bringing back the country’s forest cover. 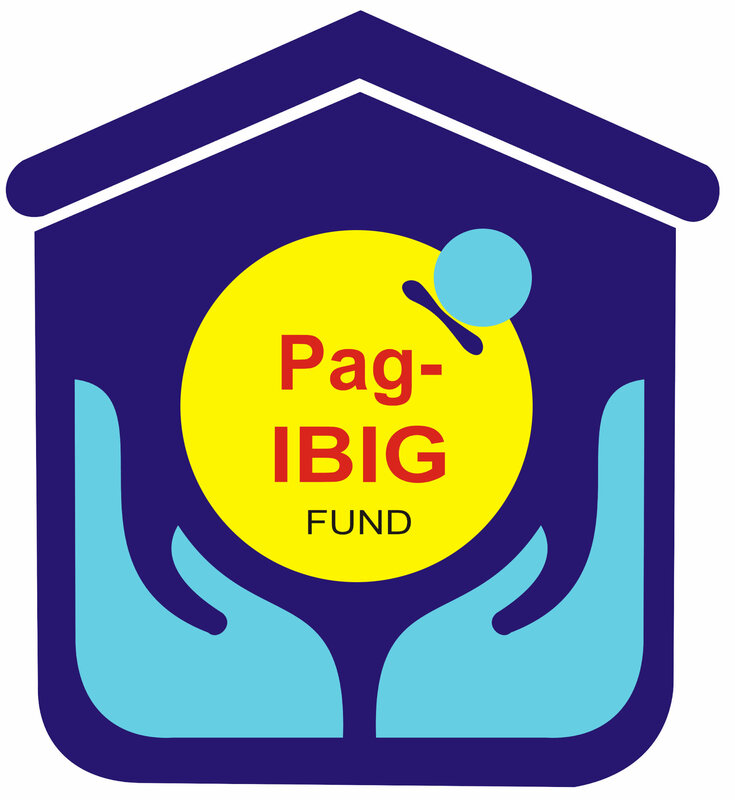 The Pag-IBIG Fund (Home Development Mutual Fund) recently opened its new Service Center in the City of Bogo to bring its services closer to its members. During the opening, a total of 25 clients availed of the services (concerning printout of contributions, Multi–Purpose Loans, membership verification and receiving of Multi–Purpose Loan applications). The Bogo Service Center will also serve Pag-ibig members from in the municipalities of San Remigio, Tabuelan, Borbon, Tabogon, Medellin, Daanbantayan, Sta. Fe, Bantayan and Madridejos. The City of Bogo celebrates its 5th year of cityhood. And yet, it seemed but only yesterdaythat we finally earned our right to be recognized as one. It was a recognition bitterly fought at the highest court of the land; it was a victory that, no doubt, is a major one. But as far as we in the administration are concerned an even greater struggle is at hand: proving we can achieve the goals we had set in the first place when we pursued the dreams of cityhood. Rome was not built in a day, thus we are trying our best to fashion the tools of governance that wiull help in achieving the goals we had set for our city and our people. We are fortunate our efforts in this direction have been recognized. 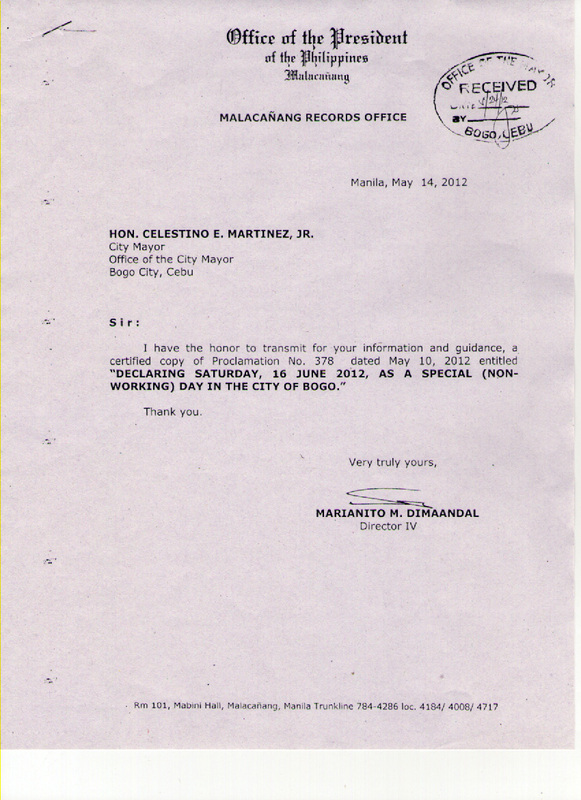 The Department of the Interior and Local Government (DILG) has fiven the City of Bogo the Seal of Good Housekeeping. It is an award given to local government units in recognition of their good governance pratices for its efforts in the areas of Good Planning, SOund Fiscal Management, Transparency and Accountability, and Valuing Performance Management. Of course, we still have a lot to do if we must grow at a pace consistent with real progress. In this regard we ask the cooperation and patience of our constituents. We give our assurance that, as the government agency charged with the supervision of local government units has recognized, the City of Bogo is doing its job. Hence, to all those who in one way or another have extended a helping hand so that Bogo may become what it is today and, more importantly, a true city of man that will be in the future, our sincerest gratitude and prayers. 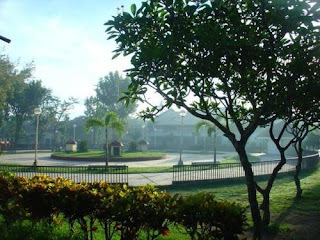 Bogo City is in the northern part of Cebu Province. The approximated distance of Bogo from Cebu City is 101.9 km. The roads to Bogo are now asphalted while the other parts are cemented. Transportation using public vehicles are available. Boat services bound for its neighboring islands, Leyte and Masbate, are also available in the city. It is almost located at the tipmost North making its doors open to other provinces just like Leyte, Masbate, and Bantayan Island. This geographical location makes Bogo the trading center of Northern Cebu and is also called as the "Queen City of the North". Bogo has a tree scientifically named "Garuga Floribunda", a 15-meter tall tree with fairly small dark round flowers and long and pinnate leaves. Not known to many, Bogo got its name from this tree. Bogo started as a small community along the shores of Nailon. 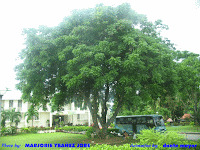 Early settlers and traders used the tree they called "bogo" as their shelter and protection from sunlight as they do tradings under its warmth and shade. Since then, "bogo" become a landmark which is known to traders and merchants coming from different places. The power of the word easily spread until the place where the tree is located was called Bogo. However, it was said that during that merciless Japanese bombong on December 12, 1942 all the records of Bogo has been burned to ashes. Inspite of that, Bogo has never stopped striving. Nevertheless, the physical characteristics of Bogo shows that it is worthy to be recognized. With the area of 10, 700 square kilometers, a population of 63, 869, households of 13, 509 and a labor force of 29, 000 (based on the 2000 census), who says it can't be rich? With matching soil type of Faraon Clay, steep phase Bolinao Clay, Medellin Clay, Lugo Clay, and Hydrosol; and a climate which is at the third type characterized by a non-pronounced wet period from one to three months; relatively dry from the second half of November to April, Bogo did show-up. With these area, soil type and climate, it produces and supplies nipa palms, coc lumber, sugarcane, corn, coconut, bamboo, shells, fish and marine products and dry goods. Not only that, it also has skills for carpentry, masonry, tinsmith, metalcraft, sugarfarm workers, shellcraft, fishermen, professionals, and businessmen. Bogo have been fighting since 1800 and is still aiming to have a great success while on the way of improving physically and economically. The 29 barangays of Bogo blossomed. Developments at both the rural and urban barangays is helping Bogo to boost up the economy of the town. Each has something to be proud of and recognized. Bogo is never giving up, and because of that, it had gained awards. On December 14, 1994, a very unprecedented event in the colorful history of Bogo happened. It was crying time, the tears of jubilation fell, rejoicing and pride came in. Bogo was declared as the "Cleanest and Greenest Municipality in the whole country". What an honor! And wanting more, three weeks later, January 6, 1995, we plucked another one: "The Most Outstanding Local Government Unit in Region VII". What made these possible? These outstanding achievements are the reflections of our unity, attitude, and character as a people. Bogohanons have that extraordinary zeal to excel, the burning desire to be above the rest. Bogo never fail to get a lot of achievements every year, and one of its most significant achievement is the town's proclamation as a newly created component city just last June 16, 2007, the Charter Day of Bogo. Just like what our present mayor said, "I cannot do this alone, but we can do this together". With the triumphs in converting the whole town, we are still facing daunting challenges. But nothing can bring us to a standstill for Bogohanons are born achievers. Together let us prove our worth! Here is a fun video that I found on YouTube.com. A fun summer experience in Capitancillo. The City of Bogo is named from a tree, Garuga floribunda, that flower into full bloom in the short summer of October. Bogo trees abound in the locality and have been part of the trading culture of the population before the turn of the 19th century. The people were highly engaged in fishing, agriculture and commerce and trading is done at the shade of the Bogo trees. The city is located in the northern part of Cebu Province and is approximately 100 kilometers away from Cebu City, where one can take a two-hour bus ride. It is also accessible by sea from Masbate, Daanbantayan, and Bantayan Island. Its location, thriving agriculture and fishery industry and the presence of three wharves — Polambato (for ships and shipping vessels), Poblacion (pumpboats and fishing vessels) and Nailon (motorized pumpboats and bancas) — strengthen its bid to become the center for trade and commerce in the area north of Cebu. Thus, while the city exudes a laid-back charm, locals and tourists enjoy the convenience of department stores, fast food restaurants, banks with ATMs and reliable communications and data services from trusted communication companies. In addition, Bogo has 4 colleges, pension houses, huge public market, public pier, boats going to Leyte and Masbate, parks, main plaza, museum with library, San Vicente Parish Church, Verallo Memorial Hospital, doctors, dentists and more! 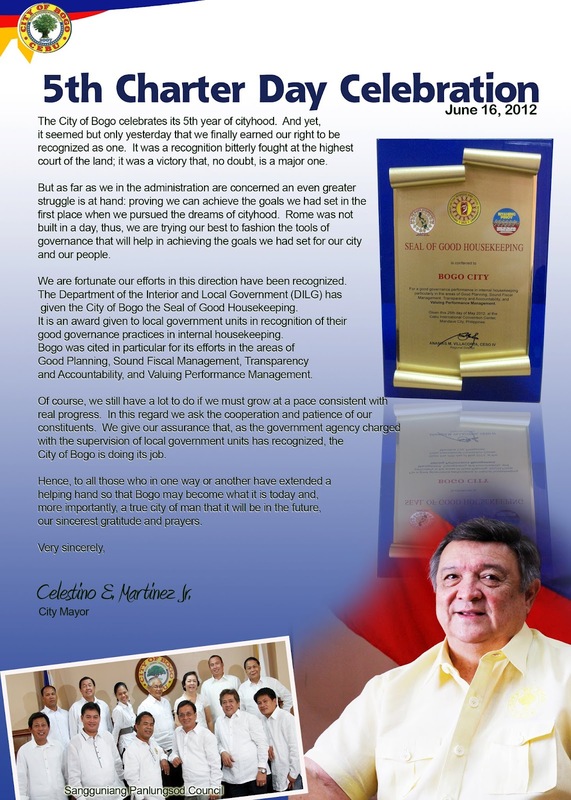 The City of Bogo has been adjudged as a National Hall of Fame Awardee as the Cleanest and Greenest Municipality (then) in 1998. In the same year, the municipality was accorded the Healthy Market Award by the Department of Interior Local Government (DILG). It is also recipient of the Regional Gold Award as Most Outstanding Municipality for 1st to 3rd Class Category in Local Budget Administration in 1999. The City of Bogo is now a 4th class city in the province of Cebu. It was voted for cityhood last June 16, 2007 and is now one of the component cities of Cebu. A popular delicacy made from ground corn and wrapped in corn husk and known as pintos, is the star of a new festival in Bogo. The Pintos Festival, which coincides with the town fiesta during the latter part of May, replaces the Kuyayang Festival, with its roots in a traditional courtship dance. The shift in focus from the kuyayang dance to the popular pintos, reflects a positioning more aligned with the city’s strengths: Most of Bogo’s flat lands are devoted to agriculture, with corn among the chief products. 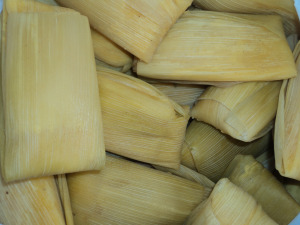 Made from ground corn, milk, and either butter or margarine and wrapped in corn husk, Bogo’s pintos is among local and foreign tourists. While the sweet delicacy is now the center of efforts to promote the city, through the Pintos Festival, Bogo has other attractions. Attractions range from the religious to recreational. 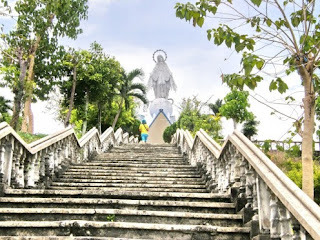 A popular spot is the Shrine of Our Lady of the Miraculous Medal in La Paz, Bogo City. Many devotees of the Blessed Virgin Mary light a candle and say a prayer at the foot of the giant image, after climbing 100 steps up the hill. 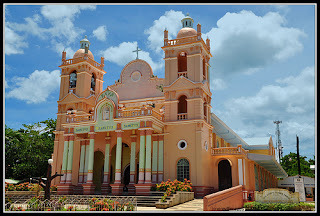 Another is Our Lady of Remedios Parish Church in Odlot, Bogo where devotees flock for prayers of healing. This features the images of Our Lady of the Remedios (Remedies), San Paplo (Saint Paul) and San Pedro (Saint Peter) that were cought by fishermen with their nets in the sea near the current parish church. The Parish Church was founded in 1980 and many healings have taken place in this parish church. Mother Mary is reported to have shed tears. There is a healing mass every Wednesday and the priest gives credit to God for the healings. The church is undergoing expansion and the facade will be finished soon. The presence of nearby white sand beaches, dive sites and golf courses also offer alternatives to first-time visitors of Bogo. Fast becoming a favorite is Capitancillo Island, an isolated six-hectare coralline islet some 30 minutes away from the city via banca. On the surface is a solar-powered lighthouse, sitting among the remains of an old structure. Rebuilt in the 1950s, the lighthouse is one of the oldest lighthouses in the province. But the true beauty of the island lies in the seas beneath. Capitancillo has a shallow edge which drops down from 25 to 40 meters, making it ideal for snorkeling. The main attraction, though, is diving. 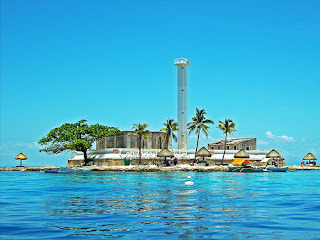 Just off the island are three dive sites: the Capitancillo Island’s own southwest wall and the Ormoc and Nunez shoals. All have shallow reef-tops at 33 feet leading to drop-offs with colorful soft corals, gorgonian sea fans, caves and black corals. The main interest of the dives are the walls, with their many caves and overhangs, small shoals of pelagic fish, all varieties of reef fish, whitetip and gray reef sharks, and the ever present possibility of encounters with larger pelagic species. 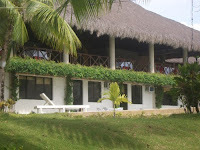 Those looking to just lounge around and swim can choose from nearby beach resorts in Barangay Nailon or the more popular resorts in the neighboring towns of Medellin and San Remigio. Golf enthusiasts, meanwhile, will be more than pleased with the presence of two world-class golf courses near Bogo City. 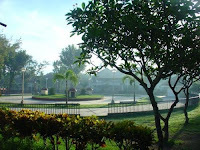 In Medellin, the exclusive Mercedes Plantation Golf Club in Barangay Dayhagon ca be found. Those with families can also opt to stay at the Casa del Mar Golf and Dive Site, which features a white sand beach as well as the Verdemar Golf Club in San Remigio, a town some nine kilometers west of Bogo. This is Bogo, it may not be much to many but it means the world to me. This is the place that molded me. Definitely a place to go. i am a person with a joyful and happy heart. i live each day of my life to the fullest so that i may never have regrets. "be happy, positive and hopeful!".... live life as if there's no tomorrow! Here are the winners of the Bogo City's Pintos Festival 2012. Mark your calendars! 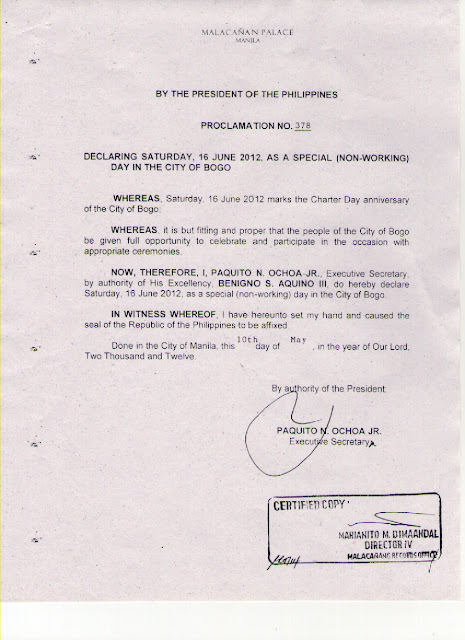 June 16 has been declared by President Benigno Aquino III as a non-working holiday in the City of Bogo in celebration of its Charter Day. 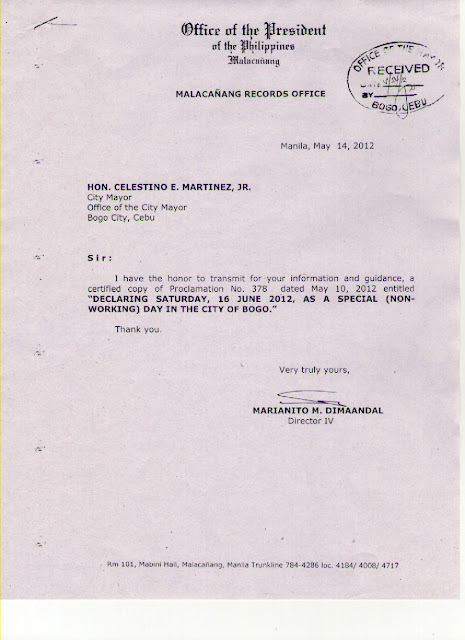 The President signed Proclamation 378 last May 10 which gives the Bogohanons the full opportunity to celebrate the said occasion. The plebiscite for the cityhood of Bogo was held on June 16, 2007. It became a component city of Cebu Province by virtue of R.A. 9390.